Looking for a printable calendar 2019? It’s a big day today here in the blog because I am officially launching the Shining Mom 2019 printable series! To start off, let me share with you this beautifully designed calendar with a room for your notes. My heart is thumping in joy to bring to you this pretty printable that you can use right away! Yes, it’s for FREE! Friends, I can’t hide my excitement! One of the things that I always look forward to here in Shining Mom is creating yearly planners and calendars. I really enjoy designing them. They give me the feeling of having a fresh start once again. I love creating practical and functional organizers that are sure to help my readers. And I especially love to see them putting my creations into good use. Yup, my heart leaps in delight when my readers tell me that my printables help them stay organized and be more productive. And since it’s going to be 2019 before we know it, I thought of already launching the Shining Mom 2019 printable series. I know allot of you are already looking forward to planning your year early so let’s roll the ball! So friends, from this day on, you can already expect a series of 2019 printable planners and organizers from me. 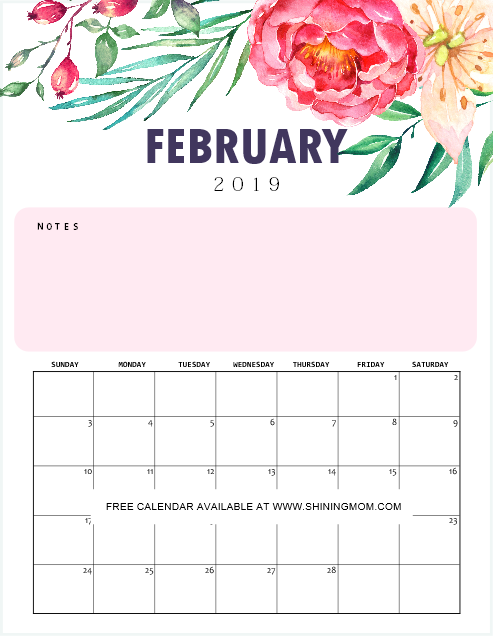 Let’s get started with this printable calendar 2019 to officially launch the series! I guess you’ll love this beautiful calendar that I have for you! 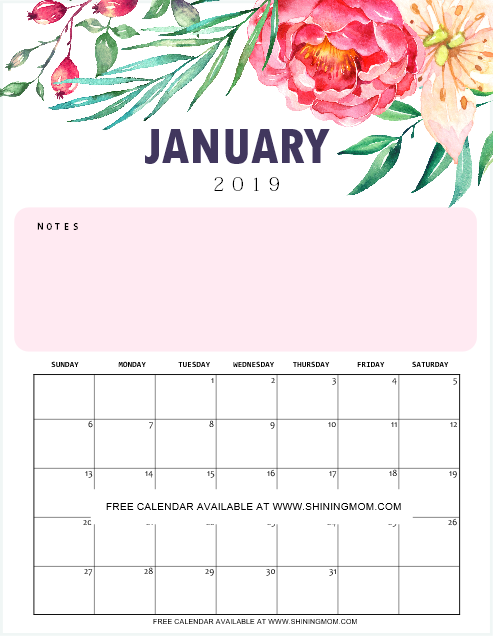 The Free Printable Calendar 2019: Pretty and Functional! If you’ve been following the blog for any amount of time, you know for sure that I am very particular with the simplicity, beauty and functionality of each and every planner I make. And this floral printable calendar 2019 proves that to be true once again. Yes, your freebie today is not just beautiful–it will also keep you focused, organized and productive yearlong! I have added a special room for your notes that you can use to write your monthly goals, major to-do’s, special events, and more. Take a look! Right on top of each and every calendar for the month, you’ll find a pink box that can be utilized for your notes. You can definitely make that spot work for you. You can use it for your personal notes, reminders and more. And as for me, I will be using that space to write my major goal for the month and perhaps a sweet quote to keep me inspired. How about you? How are you going to maximize the space provided for? Let’s take a closer look to the calendars that I have for you. The calendar also has a good room for your daily planning. I am pretty sure it will help you organize your schedule so you will not miss anything important again! The gorgeous floral elements that I incorporated in the design are from OctopusArtis, which you can also purchase to create your next printable project. Start your year right with this refreshing calendar that is sure to inspire you yearlong. Remember to write your major to-do’s or important reminders for the month at the notes section to keep yourself on the goal. The next preview that I have here is for the month of February. Won’t planning the love month be blissful in this pretty planner? Check out the rest of the calendars in your download. I am pretty sure they’ll help you get organized for the whole year of 2019! Use the calenfar to successfully manage your schedule. You can even use it as a meal planner, habit tracker, project planner and more! Receive the Whole Set of Printable Calendar 2019 Sent Straight to Your Inbox! Looking at Successfully Managing Your Finances, Too? One last thing! If you’re loving this beautiful calendar, I am pretty sure you’re going to love the ultimate budget binder available on the blog, too! Introducing… “My Wealth Binder” a complete financial binder that is super pretty and that’s sure to help you cut off your debts, organize your bills and increase your savings and investment. Get the super affordable 70-page binder HERE or learn more about it! 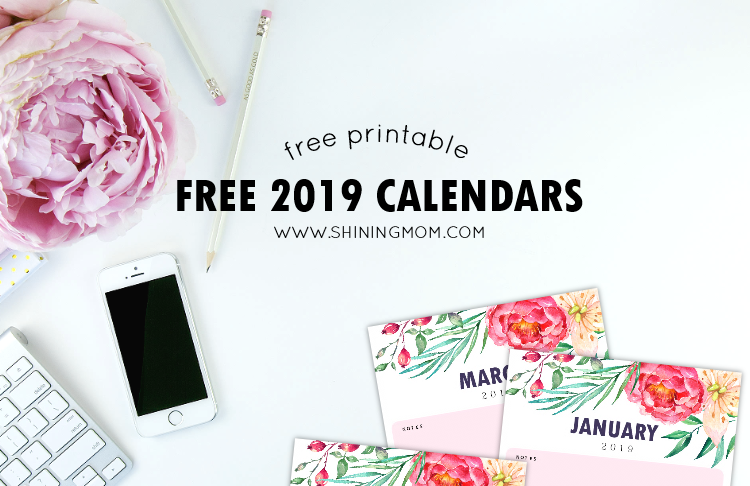 No time to print the free printable calendar 2019 yet? Pin this post at Pinterest so you can find it again later. You’ll also help this blog grow that way. Do you want to receive a Monday to Sunday version of this printable calendar 2019? Let me hear you at the Comments, If I receive 20 requests, I shall update this post and add your requested calendar format. Have an amazing, blessed and prosperous 2019, friends. Cheers! 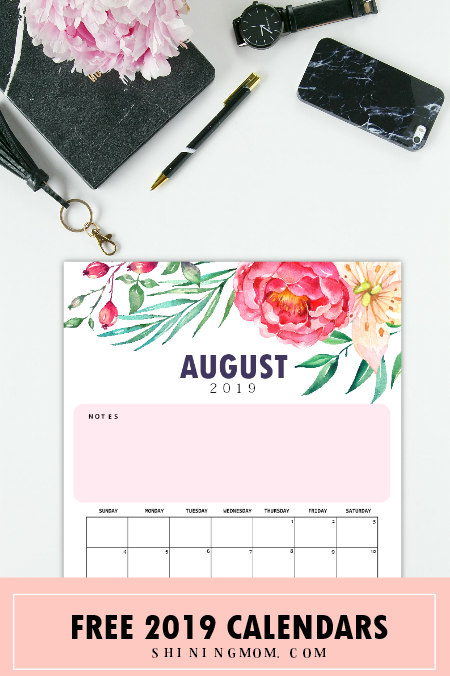 « Free Printable August 2018 Calendar: 12 Awesome Designs! Hi there! Thanks for the gorgeous free downloads. I wanted to let you know that the January and February pages appear to be watermarked. The other months are fine. Maybe there’s something I’m missing, but I’d love to be able to print the first two months without the watermark. Thanks so much. I have already updated the file. Please check your email and download it again. Sorry for the inconvenience. Thanks. I love your site and thank you for the free printables. I recently retired from teaching and I have been trying to set up a binder system to keep track of all the things I need to do for my home, my finances and my job search. I love the scripture calendars! Thank you for sharing your wonderful products. May I pin you and share your site on my Face Book? I’d like the Monday to Sunday version. Your images are beautiful! Would love to get the Monday to Sunday planner too! 🙂 thanks for the free printables! Hi Wanda, thanks for sharing your beautiful printables! I would love to get the Monday to Sunday version too! I would love to get the Monday to Sunday version please! Soy nueva en todo esto… buscaba un planner 2019 y encontrame con todo este diseño cargado de dedicación y amor es un lujo. No encuentro el modo de descargarlo lamentablemente. Thank you SOOOOOOOOOO much for this calendar! It is beautiful and it was exactly what I was looking, and for free! A big thank your from Argentina! Have a fantastic 2019! Please design a Monday to Sunday version of the 2019 calendar. would it be possible to download Monday-Sunday version of calendar, please? It looks very nice but it is unusable without that for me. Thank you a lot!